I've had a very stressful week so I decided that I would relax this morning and read a bit. 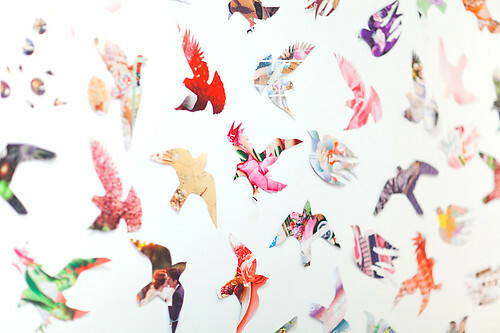 But when I opened up my magazine, tons of paper birds started flying out! and my bedroom all day. but they keep messing with my doo! they look like a nuisance! but they're beautiful! I love the birds. You are so creative Katie! Wish I had some on my walls. Ha ha! Fantastic ideas! I love your creativity. This looks amazing, I love the idea! haha I love the way you think Jaky! I probably say this in every comment, but you are SOOO CREATIVE! These are just beautiful! At least they don't poo on you! Oh Katie you never cease to make me smile! How did you cut them out so perfectly?? Birds invaded my room too! haha that last picture made me smile! You just made my day! AGAIN! I wish I lived in your apartment!!! hopefully the worms saty out of your home today! wish i had some birds in my room!!! Oh no I hope they did not cause you additional stress! I found your blog and I'm hooked! You are the best! Would you mind if i did this but on a much smaller scale for my art exam? I hope all your technical dilemmas have been solved! Sorry its been a rough week. Don't those times really make you appreciate a "normal" day?!? Just let those birds fly away with all your stressful thoughts! i love your creativity ! Oh my goodness! Could this be any cuter!? those birds look like they were a blast to have around...! aw i'm so glad you got your blog back from those nasty hackers!! 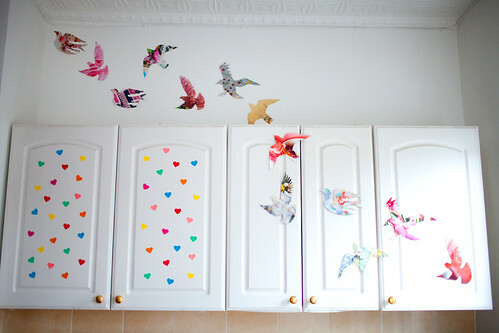 love the birds you cut out!! I love it! So bright and colourful! Really made me smile! Just don't let it turn into a scary situation like in that movie! this is so funny to me because i had an actual, live bird trapped in my kitchen today. i have no idea how it even got into our house!! Moo must be exhausted now, with all those birds fluttering about! I'm sure a billion people have already said this to you before but I'm going to say it as well... your blog/imagination is amazing and I am in total awe. amazing! the last photo is made of win! i love your narrative qualities! So much fun! Enjoyed the creativity and i love the last shot! Will they be nesting in your house for long? 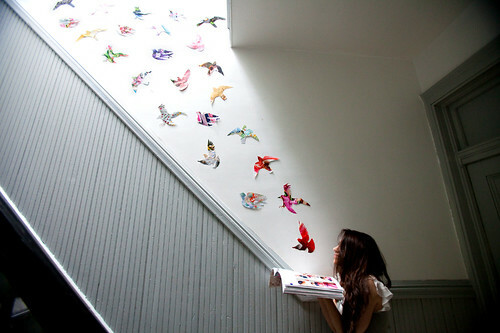 Beautiful, I want some in my own room too ! Did you use a template to cut these birds out ? love love love the birds.... this post makes me all kinds of happy. thank you. They are lovely! Hope you have a big apartment though because otherwise I can just imagine the sound level! I so love your photos.They always make me smile & today was just the right day to click on your blog. and these birds... teach them to fly to Portugal. i'm glad to welcome them into my home... so lovely indeed! maybe because you share your wings. Sooo many colors! My eyes just melted! Good job! U're so cool katie!!! I posted ur lovely ideas on my blog too to spread the love and your joy!! Thanks so much for all of your sweet comments! To make the birds I googled "bird silhouettes". I then printed out some shapes, cut them and used them as stencils to trace onto magazine pages and cut them out! @Paulina- I just use masking tape to stick them to the wall. It doesn't leave any marks! nooooo, i don't believe you have stressful weeks! from out here, your life looks like pure joy, all the time! Damn ! that's some nice pics you got ! Better then drugs, therapy, or church. @colormekatie Awesome! Thanks! I think you just convinced me to stick stuff all over my walls! I've been craving it for a while! my favorite post of your's EVER! so fun and day-brightening! I love your artwork...but...do you ever get tired of being "on" all the time? You seem like the classic "manic pixie dream girl" character in a Hollywood movie. it's good to see that you have your blog back! :) gratz! I just spent two hours reading your entire blog. Thank you for the pick-me-up. Oh my.. I love this! Your blog puts a smile on my face. Thanks so much for sharing all these lovely things. Between this blog post and your daily craft of paper birds, this has been the most beautiful stuff I've read all week. Just found your blog today from Poppytalk! I just love what you do! Love your mini documentary, love your birds and all that color. It certainly brightened my day today and will continue to. Thanks for being you - a breath of (colorful) fresh air! HI Katie! I absolutely LOVE your blog! I am saving up for a camera, and wanted your advice for which one to get. I am 14 so an easy one would be nice! :) Thanks!! Hi katie, i am SO amazed by your photos and you blog. And those birds are the most cutest things ever. you are so funny. you cheer me up. Your blog is so colourfully expressive and prissy :) LOVE The cat! have a groovy weekend! This is the cutest thing ever, i have just been browseing most of your blog, watching a lot of your videos on vimeo, your actually adorable. I just spent several hours reading all your posts. Fantastic. And the birds are awesome. Best. I stumbled upon your website and love it. Pretty cool pictures. I will visit it again. Wow ! 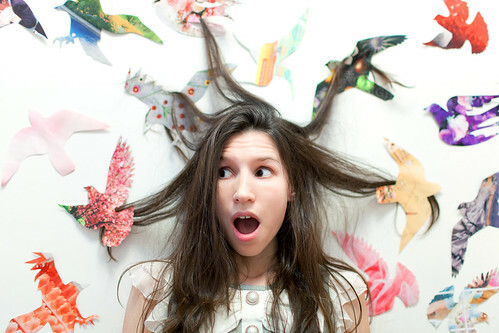 I really looveeee your blog. It makes me want to start my own..
oh, you make me so happy! how cool is that. Surely a nuisance when they did that to your hair but you gotta love them for all their sweet song. ;) I love this! how long did it take you to post all those up?! today was my first time reading your blog but it won't be the last! awww... you make me happy. I love visiting your blog when I feel down and crappy about grad school. Thank you! Katie, you would make such an amazing children's book author with your whimsicle and creative ideas! Have you thought about this? These pictures are great! Did you take them or photoshop them yourself? if you would like to exchange links let me know! loved the "Birds" moment at the end - almost as much as I loved this whole concept. It's just been added to my "to do" list for the weekend! Thanks so much for the inspiration. Amazing! Can't tell you how happy I am that I discovered your blog, what fun you are! I'm venturing out to Brooklyn this weekend, hope I stumble upon some of your work! Have a lovely, sunny weekend! Loved this so much! 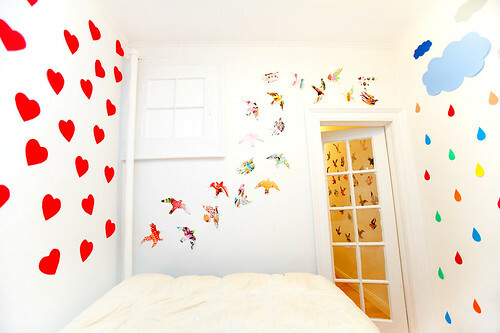 I had a rainy groggy day and did a similar thing with 3-D flowers all over my walls! Such a cute idea! I LOVE THIS. Thank you very much Lovely. This adorable craft made me think of the song Birds by Kate Nash- you should check it out it's beautiful!